The Body Shop Facial Massager | £6 // This purchase was inspired by Caroline Hirons and although it's not something I use too often, it something I try to do every now and again. I find it relaxing to just sit and catch up on Youtube while giving myself a five minute facial massage. I probably don't use it enough to see much difference in my skin but I keep at it. Yu Ling Jade Roller | £22 // This gets more use in the summer months as I find it's one of the few things that makes my eyes feel better when I'm having a particularly bad hay fever day. The jade keeps the roller cool and it helps to reduce puffiness. It may not be an essential for everyone but it is for me. Clarisonic Mia | £120 // I've added this into the mix to remind myself I need to use it more. I have the sensitive brush head on it at the moment to make sure I don't damage my skin. When I do use it, it's only once a week as a treatment rather than to cleanse my skin. Out of the cleansers I currently have, I find Liz Earle Cleanse & Polish works best. Asda Cotton Pads | £1 // Some might not think twice about cotton pads but I love these ones from Asda. They're big enough that I can take off my mascara on both eyes with just one. They also don't fall apart from soaked in eye make-up remover. They also don't fall apart from I use them to take my nail polish off like some others do. 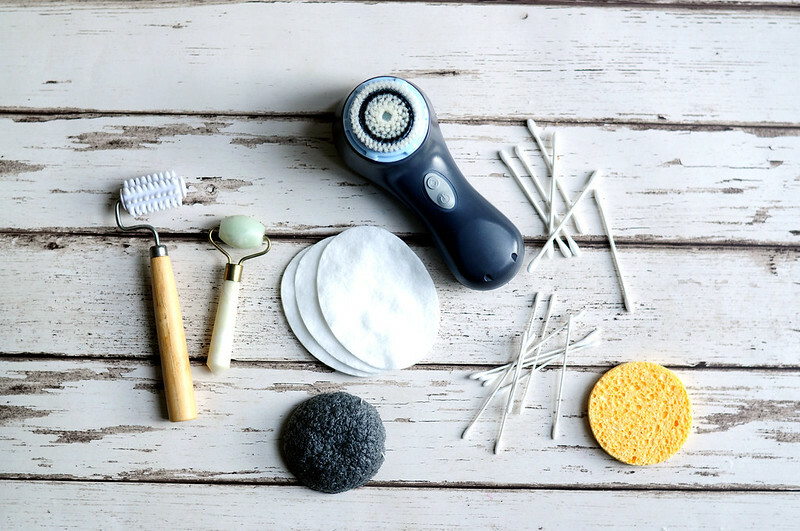 Kojac Sponge With Bamboo Charcoal | £7.99 // Think of this as a more natural version of the Clarisonic. You use it in conjunction with your cleanser of choice and it gently exfoliates the skin and making sure your skin is as clean as it can be. Muji Cotton Buds 200 pack & Thin | £3.50 & £2.50 // I've used these ever since Anna mentioned them and I am so grateful. The bigger cotton buds are pretty standard but it's the thinner ones that I need to rave about. They are tiny and make removing mascara smudges or perfecting eye liner so simple. If you keep the original packaging then you can buy a refill pack for 50p cheaper which makes them even more of a bargain. I'll be stocking up on these so I'll never be without. Liz Earle Sponge | £2 // I don't like to use a muslin cloth to remove face masks and instead prefer to use this sponge from Liz Earle. It removes the mask with ease while also gently exfoliating the skin. They also last a decent amount of time especially if I make sure it's rinsed out properly and dries out between uses.